A seat belt, sometimes called a safety belt, is a harness designed to hold the occupant of a car or other vehicle in place if a collision occurs or, more commonly, if it stops suddenly. Seat belts are intended to reduce injuries by stopping the wearer from hitting hard interior elements of the vehicle or from being thrown from the vehicle. In cars, seat belts also prevent rear-seat passengers from crashing into those in the front seats. Lap: Adjustable strap that goes over the waist. Used frequently in older cars, now uncommon except in some rear middle seats (also in passenger aircraft). Two-point: A restraint system with two attachment points. A lap belt. Automatic: Any seatbelt that closes itself automatically. Used mainly in older luxury models. Sash: Adjustable strap that goes over the shoulder. Used mainly in the 1960s, but of limited benefit because it is very easy to slip out of in a collision. Lap and Sash: Combination of the lap belt and the sash (two belts above). Mainly used in the 1970s, usually in the rear. Generally superseded by three-point design. Three-point: Similar to the lap and sash, but one single continuous length of webbing. Both three-point and lap-and-sash belts help spread out the energy of the moving body in a collision over the chest, pelvis, and shoulders. Until the 1980s three-point belts were commonly available only in the front seats of cars, the back seats having only lap belts. 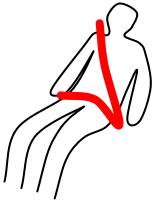 Evidence of the potential for lap belts to cause separation of the lumbar vertebrae and the sometimes associated paralysis, or “seat belt syndrome”, has led to a revision of safety regulations in nearly all of the developed world requiring that all seats in a vehicle be equipped with three-point belts. By September 1, 2007, all new cars sold in the U.S. will require a lap and shoulder belt in the center rear. Five-point harness: A safer but more restrictive seat belt. Five-point harnesses are typically found in child safety seats and in racing cars. The lap portion is connected to a belt between the legs and there are two shoulder belts, making a total of five points of attachment to the seat. Six-point harness: This belt is like a five-point harness but includes an extra belt between the legs. Six-point harnesses are used mainly in racing. In NASCAR, the six-point harness became popular after the death of Dale Earnhardt. Earnhardt was wearing a five-point harness when he crashed and died. Because it was thought at first that his belt had broken, some teams ordered a six-point harness. The sixth point has two belts between the legs, which is seen by some to be a weaker point than the other parts. Inertia reel: Used almost universally today, inertia reel belts are effectively self-adjusting, which improves effectiveness. They also retract when not in use, reducing the chances of damage to the belts. A retractor reel lets out the strap or pulls it back as needed, and in the event of an accident the reel locks, preventing any more strap to come out and holding the passenger in the car. This may be augmented by pretensioners. Most three-point belts are of inertia-reel construction, and some lap-and-sash and lap belts. Seat belts were first invented by George Cayley in the 1800s. Seat belts were introduced in aircraft for the first time in 1913 and became common in the 1930s. The automotive seat belt was introduced into the United States by Kenneth Ligon and his brother, Bob Ligon, whose patented quick release seat belt, the AutoCrat Safety Belt, was the first seat belt installed as original equipment in the U.S. by Ford in its 1956 model year. The first seatbelt to be included as standard was on the 1959 Volvo. Australia was the first country to make seatbelts compulsory in vehicles. However, they were not required by law in the U.S. on passenger vehicles until the 1968 model year. Three point harnesses were first made readily available in mass-produced vehicles by Volvo. It was Swedish engineer Nils Bohlin who patented the modern three-point belt design and gave it to Volvo. Most seat belts are equipped with locking mechanisms that tighten the belt when pulled hard (e.g. by the force of a passenger’s body during a crash) but do not tighten when pulled slowly. Many are also equipped with ‘pretensioners’, which preemptively tighten the belt to prevent the passenger from jerking forward in a crash. Mercedes-Benz first introduced pretensioners on the 1981 S-Class. In the event of a crash, a pretensioner will tighten the belt almost instantaneously. This reduces the load on the occupant in a violent crash. Like airbags, pretensioners are triggered by sensors in the car’s body, and most pretensioners use explosively expanding gas to drive a piston that retracts the belt. Pretensioners also lower the risk of “submarining”, which is when a passenger slides forward under a loosely worn seat belt. The issue of seat belt legislation has been a source of some controversy. Hospital based studies of car accident victims, experiments using both crash test dummies and actual human cadavers have indicated that wearing seat belts should provide a reduced risk of death and injury in many types of car crashes. This has led many countries to adopt mandatory seat belt wearing laws. It is generally accepted that, in comparing like-for-like accidents, a vehicle occupant wearing a properly fitted seatbelt has a significantly lower chance of death or serious injury. Within the USA, 49 states now require adults to wear seat-belts; New Hampshire has no such law. The effects of such laws are disputed, stemming from the observed fact that no country is able to demonstrate a reduction in road fatalities due to passage of a seat belt law, though deaths have in some cases been migrated from drivers to other road users. This has influenced the development of the risk compensation theory, which says that drivers adjust their behaviour in response to the increased sense of personal safety wearing a seat belt provides. In one trial, habitual wearers and non-wearers were asked to drive around a course a number of times under the pretence of testing different seat belt materials for comfort. It was found that non-wearers drove consistently faster when belted than when unbelted (similar responses have been shown in respect of ABS braking and, more recently, airbags). It is also possible that the types of injury modelled in the trials were only a subset of potential serious injuries – for example, oblique impacts may produce twisting forces on the head leading to diffuse axonal injury, a particularly serious type of brain injury. Put simply, if one is involved in a crash, one is almost always better off wearing a seat belt. However, the probability of being in a crash in the first place may be affected by the fact that the person feels safer, so the overall safety benefit may be offset to some unspecified degree.